Manny Pacquiao has never recovered from being knocked out by Juan Manuel Marquez in 2012, says Floyd Mayweather's father and trainer. 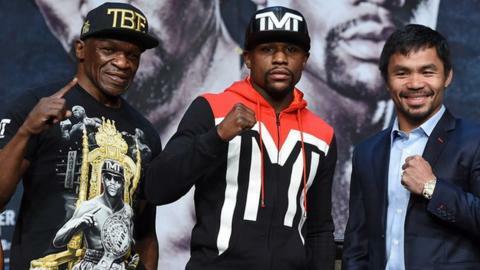 And Mayweather Sr believes his son will knock Pacquiao out again when they meet for the richest fight in history in Las Vegas on Saturday. "Once you get hit like Pacquiao got hit by Marquez, it won't take too many more punches until it happens again," said Mayweather Sr.
"This fight is already won. Trust me." Asked what he thought Pacquiao's best performance was, Mayweather Sr replied: "When he got stretched by Marquez." Mexican legend Marquez had lost to Pacquiao twice and drawn with him once before knocking him cold in the sixth round of their fourth encounter. Philippine legend Pacquiao, a six-weight world champion, has won his three fights since, although some suggest he is not the fighter that he was. However, Pacquiao's trainer of 15 years, Freddie Roach, said his charge was as good as ever ahead of his fight with Mayweather, who is unbeaten in 47 professional fights. "Manny knows that knockouts are a part of boxing," said Roach, a seven-time trainer of the year. "If you don't want to get knocked out, go do something else. "It was a bad knockout against Marquez, he was down for a long time. I was worried but when we got back in the gym there was no change, he wasn't gun shy. "But Floyd has put on extra muscle and can punch when he wants to. So I hope he chooses to come out in the early rounds and tries to knock us out. "Floyd will be looking to land that big overhand right, which was kind of a sucker shot, a shot fighters like Manny shouldn't be hit with." Roach did admit he might have trouble keeping control in Pacquiao's corner during the fight - especially of assistant trainer Buboy Fernandez. "Buboy is supposed to repeat what I say in Philippine," explained Roach. "I'm not sure that's what happens sometimes, because he talks a lot longer than I do. "When Manny was fighting Miguel Cotto, he was getting hit on the ropes and Buboy started crying. "I was thinking: 'I've got one guy doing what I told him not to do and another guy crying.' It does get a little funny sometimes."